For the first time ever, humanity can gaze at an actual photograph of a supermassive black hole. It’s an achievement that took supercomputers, eight telescopes stationed on five continents, hundreds of researchers, and vast amounts of data to accomplish. The results from this project, called the Event Horizon Telescope, were announced today at joint press conferences that were live-streamed around the world. In addition to providing a picture that will quickly be incorporated into teaching materials, the results helped to confirm (again) Einstein’s theory of general relativity, and it gave astrophysicists an unprecedented close-up of these enigmatic, dense celestial phenomena. The picture, a circular black shadow encircled by a bright orange ring, shows the black hole at the center of the huge galaxy Messier 87 (M87), which is located about 55 million light-years from Earth. In addition to being gargantuan, M87’s black hole was intriguing to researchers because of some other unique features. In some earlier pictures of the galaxy, they noticed a massive jet of plasma streaming out from its center. Scientists think that the jet is made of material that never quite made it into the event horizon of the black hole. Instead, their observations suggest that the movement of M87’s black hole (which researchers believe is spinning rapidly) accelerates nearby subatomic particles and sends them shooting out into the universe, a beacon to distant astronomers. 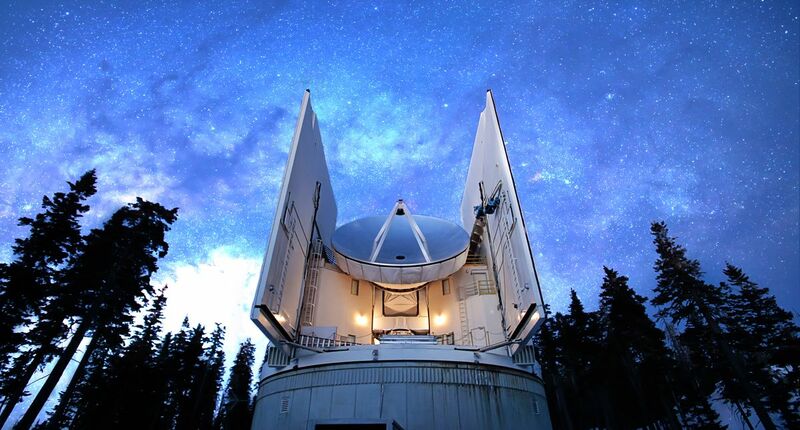 The Submillimeter Telescope (SMT) near Tucson, Arizona, is one of the eight telescopes involved in this discovery. The Event Horizon Telescope is not a traditional telescope; rather, it refers to a group of eight radio telescopes that are stationed on five continents, which all observed the same areas of space over the course of one week in April 2017. According to the Event Horizon Telescope, a conventional telescope would have to be approximately the size of Earth in order to take this particular snapshot of the black hole at the center of M87. “This is a picture you would have seen if you had eyes as big as the Earth and were observing in radio,” Dimitrios Psaltis, an Event Horizon Telescope project scientist at the University of Arizona, recently told The Verge. Individually, none of the telescopes measured up. But by coordinating their efforts, the researchers were able to zero in on M87, collecting massive amounts of data in the process. Before this picture was released to the public, the image — and the data used to create it — went through one more step: a rigorous peer-review process, vetted by researchers in the field who were not part of the project. The project published in six papers today in The Astrophysical Journal Letters. It’s a first salvo in what will likely be many more articles and analyses to come. Researchers with the Event Horizon Telescope project had four main scientific goals when they started this project. The first was simple: take a picture of a black hole. Check. The researchers also wanted a chance to check Einstein’s work. The famous scientist’s theory of general relativity is over 100 years old, and it’s held up really well over the past century. He predicted the existence of gravitational waves long before humanity had the means to detect them, and his theory also predicted that the silhouette or “shadow” of a black hole would look circular. Based on the picture released today, it passed. The other two goals were more complicated. Researchers also wanted to understand more about how black holes grow and what makes material orbiting the black hole eventually fall in. The researchers hope that the answer to that might also explain why the material surrounding Sagittarius A* (the black hole at the center of our own galaxy) is unusually dim for material circling a supermassive black hole. They also wanted to get a better idea of why and how supermassive black holes at the center of some galaxies, like elliptical galaxy M87, seem to propel massive streams of subatomic particles out of the galaxy and into the broader universe. Those two research goals are still being explored by the scientists, but they’ve already gotten a lot of great insights. Markoff explained that, thanks to the picture, the researchers can now accurately estimate the black hole’s mass, which ended up weighing in at a higher range than they’d previously thought. And they hope that once more data is released, it could give researchers insight into some of the forces that have shaped our Universe. 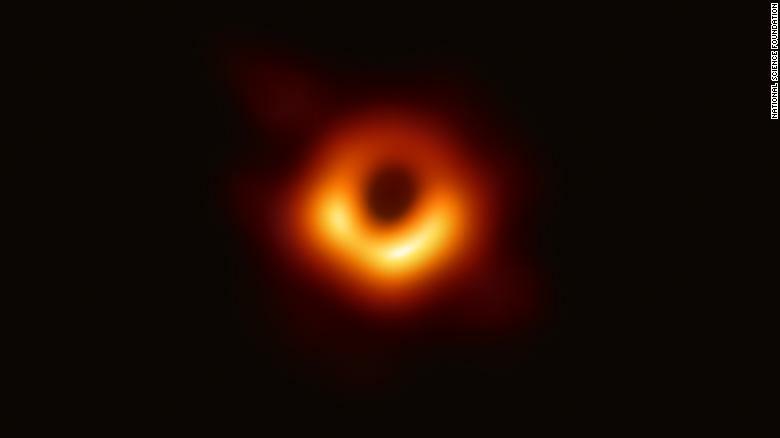 This is the first picture of a black hole ever taken, but, thrillingly, it likely won’t be the last. The researchers also focused on Sagittarius A*, a smaller, less active supermassive black hole at the center of our own galaxy. The data from that black hole is still being analyzed, but researchers like Markoff hope that by comparing the two, researchers can understand more about the life cycle of a black hole and how it influences its surroundings. Already, researchers can tell that the two black holes are very different. “If [the black hole in M87] were a dormant black hole — like the supermassive black hole in the center of our own galaxy, Sagittarius A* — then the galaxy would really have no way of knowing it’s there, and would basically be just like a pebble in a shoe,” Markoff explained. Researchers are still trying to understand the processes that can turn an annoying pebble into a dangerous thorn or vice versa. To get answers, we’ll just have to wait for the next glimpse into the densest, darkest places of our Universe. Next articleCan Movie Ratings Really Stop Teens from Smoking?